Made in Haiti said it’s Pop up Shop sales declined and it lost money in 2011, and it warned that several risk factors this year could force it to seek finical protection if business doesn’t improve. In it’s 2011 annual report, filed Thursday the Los Angeles / Port Au Prince repurposed clothing company- reported sales of $3500 last year, a 4.6% decline from 2010. 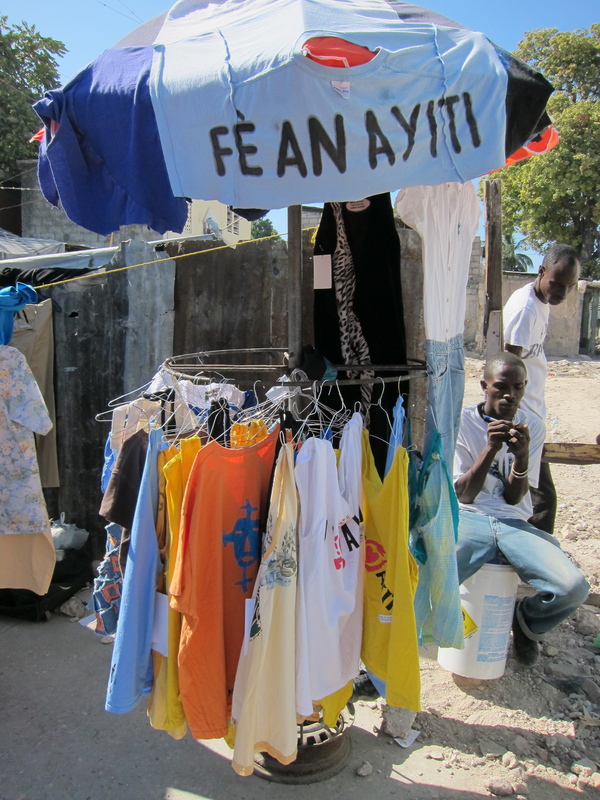 An up swing in sales occurred in December 2011, a record number of purchases by Haitians, at the Ghetto Biennale Pop up Shop. Customers purchase a garment for twenty goudes (same price as a bottle of water) and about twenty-five cents US. Customers were lined up before the shop opened, Made in Haiti takes this as a hopeful sign demand will continue. This work is a continuation of Frau Fiber’s explorations into the globalization of the apparel industry and it’s effects on day to day life. It is presented by the Ghetto Biennale http://www.yoonsoo.com/ghetto/index.html, and travel supported by California State University Los Angeles.